1Ki 10:7 But I had no faith in what was said about you, till I came and saw for myself; and now I see that it was not half the story; your wisdom and your wealth are much greater than they said. 1)Mat 12:42 The queen of the South will come up in the day of judging and give her decision against this generation: for she came from the ends of the earth to give ear to the wisdom of Solomon; and now a greater than Solomon is here. 1Ki 10:8 Happy are your wives, happy are these your servants whose place is ever before you, hearing your words of wisdom. 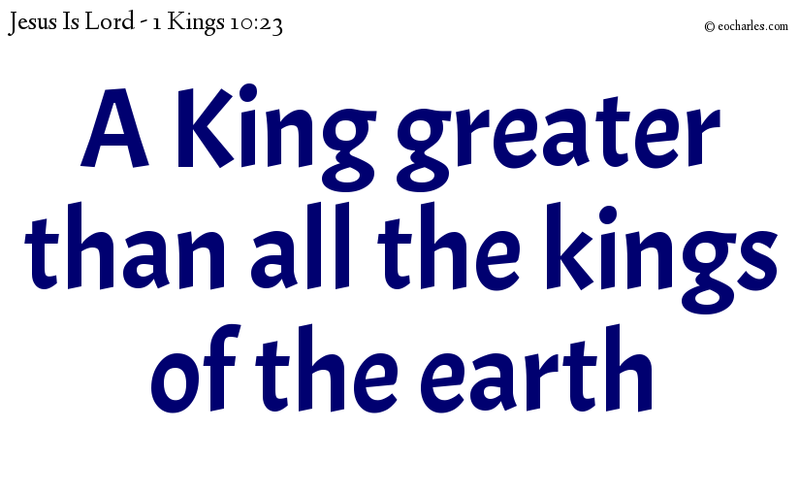 1Ki 10:23 And King Solomon was greater than all the kings of the earth in wealth and in wisdom. 1Ki 10:24 And from all over the earth they came to see Solomon and to give ear to his wisdom, which God had put in his heart. 1. ↑ Mat 12:42 The queen of the South will come up in the day of judging and give her decision against this generation: for she came from the ends of the earth to give ear to the wisdom of Solomon; and now a greater than Solomon is here.